I hope you all are in the best state of your health. When you interact with someone, the first thing that comes in contact is your eyes, so it should be accentuated. Isn’t it? After-all beautiful eyes have the propensity to cast a magic spell on to the observer and drawing the eye-lines will make your eyes more attractive and add extra beauty to your facial look. So if you desire to express yourself with your eyes then liners are just for you. Today, I am going to review one of my all-time favorite liquid eyeliners from Lakme, a brand that needs no introduction. Lakme is one of those brands that have never failed to impress us with its good quality products. 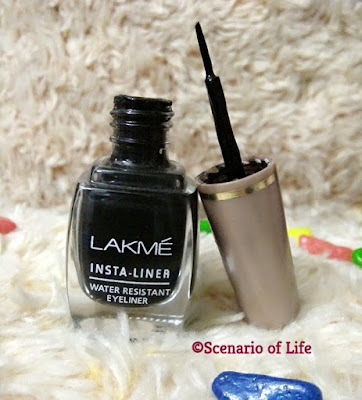 I like trying different kinds of eyeliners always, but Lakme eyeliner is the product that I am using for years and you can always find it in my vanity. So I just thought to share my experience with the product. Let’s get right into the review. The company claims that Lakme Insta Liner is water-resistant eyeliner. It is easy to use. Swipe the liner brush over your upper eyelids closer to the lashes to get your desired look. You can use it to create an ultra-fine lashline definition, a feline flick, or a dramatic look. I wonder how the brands like “Lakme” miss this part. Yeah, this product does not contain any list of ingredients in it. The product comes handy in a tiny nail polish kind of thick glass bottle with a screw cap that has a thin applicator brush, with a smooth tip, attached to it. The bottle is transparent and the color of the cap is sleek peach. The packaging of the product has remained the same ever since it has been introduced in the beauty market and it is convenient for travel purposes. The consistency of this product is well which is neither too thin nor thick and is light in weight. The texture of the liner is very smooth hence it glides on eyelids smoothly. The liner is deep black in color and one stroke is enough to get that dark black color. This is perfect for everyday use. My personal opinion is that this product is absolutely amazing. This eyeliner not only makes my eyes pop immediately but also gives a dramatic vibe to my eyes and makes me stand out as well. I tried a number of different eyeliners from other brands, but I always come back to this product simply because it is smooth, pigmented, smudge-free, and pocket-friendly, and what else a person wants? The applicator brush that comes with the product is precise enough to draw lines over my eyelids in an even stroke and I use this to create various looks. Though one should check the brush while purchasing this liner because sometimes the brush bristles are uneven which doesn’t help in precise application. This product has the right consistency and it really lasts me for quite a long. The pigmentation of the product is well. I don’t need to layer up the product over my eyelids to get the deep black color. One stroke can do it well without cracks. The liner is glossy when applied, but it gives matte finish as soon as it dries out. I have to say that it takes a little longer to dry out, but I am okay with it. The staying power of this liner is quite good. It stays all day long and does not fade. The formula of this product makes it smudge-proof. As the company claims, it is slightly water-resistant and by that I mean if I get in contact with water in any case and if I rub my eyelids then it gets off, so I make sure not to rub or touch my eyelids if my eyes get in contact with water. Overall, this is a great product. I would say I am in love with this liner. Does not flake after drying. Gives matte finish after drying. Perfect eyeliner for daily wear. The ingredient list is missing. Takes little long to dry. Stings a bit if it gets in contact with eyes. Yes for sure! It is one of my favorite liquid eyeliner which is economical and a quality product overall. Yes, I will. If you are looking for a quality product for daily use at an affordable price then this eyeliner is perfect for you. You can buy it from here. Also, this is one of the best eyeliners for makeup beginners out there. I’ll definitely recommend this product to all the beauties out there. So, go and grab it for yourself. It retails for Rs. 110 for 9 mL. 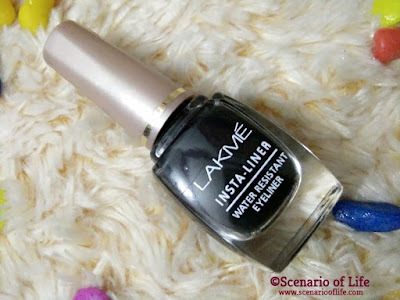 Lakme has always been a no-question-asked choice for my wife. I absolutely believe that it stands out from all others. Seems like Lakme is a product worth the money. Ill see if my girlfriend has used it yet.. if not, then I have something to recommend. Thanks for sharing! You are right, Lakme is a great product! I've tried liquid liner and it ended up everywhere it shouldn't be. I need to see a youtube video tutorial on how to apply liquid liner because apparently, I'm a dork, lol. I actually have a bottle of this brand. This eyeliner is my very fast liner and always been my favorite. Truly zed black and affordable. It sounds like a great product, but I prefer the pencil type of eye liners. I am unable to get a straight line using a liquid eyeliner. Water resistant liner? I need this! I'm always looking for makeup that won't rub off throughout the day.